Background Born to a newspaper editor and a martial arts master, Yen began practising tai chi and wushu at the age of four. At 16 he was sent to the Beijing Wushu Academy, where he studied under the master who taught Jet Li. Upon graduating he moved to Hong Kong and was discovered by action director Woo-ping Yen, the man responsible for making Jackie Chan a superstar. Success eluded Yen for a few years, until he made Once Upon A Time in China II in 1992, which paired him with Li in a fight scene that revolutionised the genre and is still widely regarded as one of the best ever committed to film. Less than 10 years later he was making films in Hollywood – Blade II, Shanghai Knights and Noon – while in Asia his reputation was sealed when he and Li fought a rematch in Zhang Yimou’s martial arthouse epic Hero. What’s he up to now? Playing Bruce Lee’s mentor Ip Man in the biopic of the same name. Yen being a big fan of Lee’s, it’s a sweet role for him to play. However, it required Yen to learn a whole new martial art, wing chun, the venerable less-is-more fighting style characterised by short, powerful punches. Interesting fact Wing chun was originally developed as a style enabling women to protect themselves from men. Although Ip Man popularised it in the 1930s, its original proponent was the beautiful daughter of a tofu dealer named Yim Wing-chun. 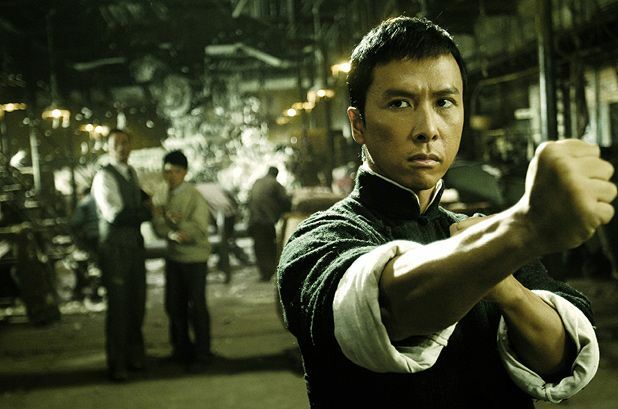 IP Man is showing at Filmhouse, Edinburgh on Wed 4 & Thu 5 Nov and released on DVD on Mon 26 Oct. Reviewed on DVD next issue. Biopic of Wing Chun, the kung fu and sifu master who taught Bruce Lee his killer moves.